Post-traumatic stress disorder (PTSD) is an anxiety disorder which develops after experiencing an exceptionally threatening or catastrophic event, e.g. natural disaster, serious accident, witnessing violent death of others, or being a victim of violent crime. The major symptoms are intrusive memory of the traumatic event, avoidance of situations that are reminders of the trauma, and hyper-arousal symptoms such as being easily startled and difficulty in sleeping. There are effective medication and psychological treatment for PTSD, and most patients will recover after treatment. 1. What are the symptoms of PTSD? 2. What makes a person more likely to suffer from PTSD? 3. What are the treatments of PTSD? 4. Will a person with PTSD recover? 5. How can friends and family members help a person suffering from PTSD? Post-traumatic stress disorder (PTSD) is an anxiety disorder. It arises after a person has experienced an exceptionally threatening or catastrophic event, e.g. natural disaster, serious accident, witnessing violent death of others, or being a victim of violent crime. The delay between the trauma and the onset of symptoms ranges from a few weeks to months, but it rarely exceeds 6 months. The symptoms last for more than a month. The symptoms of PTSD cover three major areas. Re-experiencing of the trauma in the form of intrusive or unwanted memories is the most characteristic symptom. Intrusive memories can be triggered by words, objects or situations that are reminders of the event. Intrusive memories tend to be of short duration and the patient knows that they were memories. Sometimes, there are flashbacks in which the patient feels reliving the events. Bad dreams about the events are common. Hyper-arousal symptoms includes being easily startled, feeling tense, having difficulty in sleep. Unlike the intrusive memories, these symptoms are usually constant, making the patient feel stressed and angry. The patient has difficulty in sleep, particularly difficulty in falling asleep, related to a fear of bad dreams about the trauma. Avoidance behaviour is another core symptom of PTSD. The patient stays away from reminders of the event, e.g. 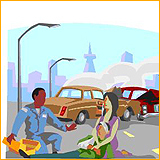 the patient avoids driving or riding a car after a serious car accident. Some patients may deny any connection between the present psychological problem and past event, together with feeling of numb, losing interest in activities, detaching from friends and isolating themselves. They might have difficulty in remembering the traumatic event. Some factors make a person prone to PTSD, while some make a person more resilient. Risk factors include an event which is sudden (no time for psychological preparation), potentially life-threatening and overwhelming (making the person feel helpless and out of control), physical injury during the event, having pre-existing history of mental illness, previous traumatic experience (e.g. child abuse), continuing presence of stressors after the trauma. Women are much more likely to develop PTSD than men exposed to similar trauma. Support from others is a factor reducing the risk of PTSD. There are psychological treatment and medication treatment for PTSD. For psychological treatment, cognitive behavioural therapy is useful. It helps the patient to face and control the fear by exposing the patient to the trauma in a safe way. It also helps to look at what happened in the event, relieving guilt and anxiety. Selective serotonin reuptake inhibitor, e.g. sertraline and paroxetine, have proven benefit in treatment in PTSD. Recovery can be expected in the majority of cases. To help a person suffering from PTSD, the first thing his friends and family should do is to encourage the person to seek appropriate treatment and stay with the treatment. Besides, listening to his feelings and providing emotional support can help. The person should be reminded that with time and treatment, the illness will be better.